Things are getting serious. After thousands of speeches and numerous debates, the U.S. presidential election is shifting to what matters the most: the actual votes. As we march towards November and the election of our nation’s 45th president, we need a little refreshment, something to get out of the dull speeches and have some hours of fun. These are games that meet substantially all of the following criteria: (1) political election is the central theme or focus of the game; (2) in the USA; (3) compelling "theme" where the election, campaign, or political process in the USA is addressed; and (4) fun to play. As always, we often share with you games that are relaxing, games that can relief the everyday stress you’re experiencing. This is why today we are offering you one of the funniest and most enjoyable games to play during the presidential elections. The name of the game is Trump Rally, compatible with both Android phones and tablets, and iPhone and iPad. It is easy to play, with simple controls and gameplay, and wonderful graphics, so it will challenge you and addict you to the fullest. Trump Rally features Donald Trump as a main character who has one goal: to win over Hilary and China. 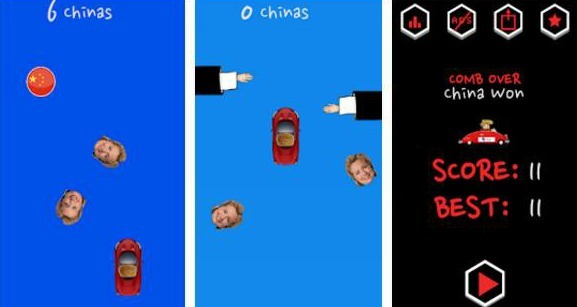 Tap and hold on your screen in order to drive the rally car and get as many Hilarys and Chinas as you can! Or you can choose to help Hilary destroy Trump and lose the game, it’s all up to you. The car can be driven in every direction you want, even backwards when you get stuck with lots of Hillarys around you. So, show your best strategy and timing skills, be precise and show your dedication to Trump. Click the links below if you want to get Trump Rally – it is free of charge on both App Store and Google Play.